When you buy your inflatable hot tub, it’s ready to go straight out of the box. Apart from a few chemicals to sanitize the water and keep it clean and hygienic, you definitely don’t need to buy anything else to have a great time. What we found, though, during our first season with our very first inflatable hot tub, is that it quickly became a centrepiece of our backyard. We used it more and more, and it became both a sanctuary and a place for fun. That’s why we bought a few accessories, to make the hot tub and our experience in it even better. Here, then, are our 9 favorite inflatable hot tub accessories of all time. They’re not in any special order, as we like them all – and now we have them, we wouldn’t be without any of them! It’s important to stay hydrated when you’re using your portable spa. When we first bought our inflatable hot tub, we used a garden table alongside the hot tub to store a couple of drinks, as well as the hot tub remote control, sunglasses, and any other small items we had with us. But this meant we had to stand up and either lean over or get out of the hot tub every time to reach them. Then we saw this neat little drinks tray on Amazon and bought one. And we are so glad we did! This Purespa drinks tray is made by Intex to fit their inflatable spas, but it fits just about every model you can think of, such as those made by Lay-Z Spa, Coleman, MSpa, and so on. That’s because the parts that grip the hot tub walls are spring-loaded, so they’ll fit securely onto the hot tub wall and keep the tray stable. The tray measures 10¼ inches long x 8½ inches wide x 7 inches high (including the legs that grip the wall). 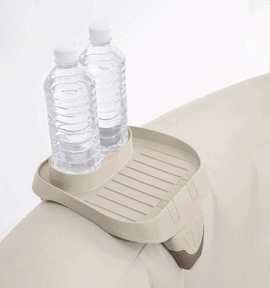 The cup holders are big enough to hold 2 cans or small glasses – but a little too small for large bottles. One feature we like is that there are small drainage holes in the bottom of the cup holders, so that any condensation runs away. This is a nice touch by Intex. The tray part is large enough to hold a remote control, your sunglasses, keys, and other small personal belongings. Top Tip: Remove the cup holder and tray before you put the cover on your inflatable hot tub. It clips on and off very easily, and it folds up so you can store it away conveniently. 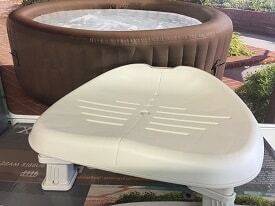 The tray also floats, so you can put it into the hot tub and then put the cover on if you prefer. Our inflatable hot tub is 28 inches high. I’m a couple of inches over 6 feet tall, so I can clamber over the side and get into – and out of – the hot tub with no real problem. However, my wife and teenage daughter struggle a little. So we bought this hot tub step from the U.S. company Confer to make it a lot easier. Now I use the steps as well – it’s so much easier and more relaxing than having to perform minor gymnastics to get in and out, even at my height. These Confer HS2 Spa Steps are 14 inches high x 28 inches wide x 22 inches front to back. The top step is 14 inches off the ground, the bottom step is 7 inches off the ground. Each step is 1½ inches thick. These steps are super-sturdy, with a maximum load-bearing weight of 350 lbs. They’re also completely non-slip, even when they’re wet; they’re made from 100% waterproof materials; and they have UV inhibitors in the plastic so they won’t ever fade. One really cool feature we like is that they’ll fit both round inflatable spas or straight-wall ones, such as the SaluSpa Hawaii. That’s because you can choose which step you have as the top one – either the curved step or the straight one. This is a nice touch by the manufacturer. Stand the two side pieces about 3 feet apart. Pick the appropriate step according to the shape of your hot tub – either the curved one or the straight one. This will be the top step and the other will be the lower step. Take the lower step and slightly lift the front of it, and place the back two sides into the slots on top of the side pieces. Now step firmly on the front of the step to click it into place. You might need to push down with all your weight. Repeat the same procedure for the top step. Voila! You’re all set to go, and you have made access into and out of your hot tub so much easier. Getting these steps is a must if you are a little unsteady on your feet, as they’ll give you support and peace of mind. These awesome little sponges will save you a lot of time and effort. They float on top of the water in your inflatable hot tub and absorb body oils, suntan lotion, sweat – in fact any contaminates that could cause a build up of scum or dirt in your hot tub filters. They also prevent a scum line from forming on the inner walls of your hot tub, saving you hours of cleaning with special vinyl cleaner over the course of a season! 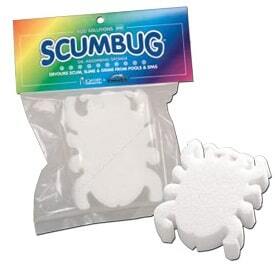 Top Tip: When you’re in your hot tub, wipe around the water line with a scumbug to remove any residue that might have built up. You can also use them to clean off residue from the underside of your inflatable hot tub cover. This inflatable hot tub accessory should be on everyone’s shopping list. They come in different shapes, to please the inner child in everyone. And, what’s really cool, is that they are washable. So a pack of two will last you a couple of years. This is another time-saving way to keep your inflatable hot tub water clean. No matter how hard we try, we always get some debris in our hot tub, such as leaves, sand and dirt. These settle on the bottom of the hot tub floor and, as well as being unsightly and a little gross, they are uncomfortable under our bare feet. That’s why we looked around for a way to get them out, that didn’t require us (by that I mean me!) having to go under water and try to scoop them up. You can buy electric spa vacuums for around $100, but we were looking for a budget version, well under $50. That’s when we came across this Aura 6250 Paradise Power Spa hand-held inflatable hot tub vacuum. What’s really great about this vacuum cleaner is that you don’t have to pump it by hand to make it work, like you do with other models. And no, it doesn’t have batteries either! To operate it, you place your thumb over the air inlet and then submerge the vacuum under water in your hot tub. When you take your thumb off the air inlet hole, the air escapes from the cleaner, creating a vacuum inside the contraption. This vacuum creates a suction action which picks up the debris. Brilliant! When you lift the cleaner out the hot tub, any water inside the cleaner runs out and leaves the dirt and debris inside a small net in the cleaner. This net is large enough to hold a fair amount of debris, so you don’t even need to clean the net out every time you use it. Top Tip: With this air-pressure system, you get about 15 seconds of suction before you have to lift the cleaner out the hot tub, let the water empty out, and then do it all over again. If you live in an area where a lot of sand or debris blows into your hot tub, it will take a long time to clean your inflatable hot tub floor. In that case, we suggest either a hand-pump cleaner such as the Game 4855 Spa and Pool Vacuum or even an electric one such as the Kokida Rechargeable Pool & Spa Cleaner. If you use your inflatable hot tub regularly, you might want to get hold of some seats for the bottom of the tub. The cushioned floor inside most inflatable hot tubs is certainly comfortable enough, but if you suffer from back pain – as I do – then the support given by the PureSpa Spa Seat is definitely worth the investment. It’s also a good option if you’re not that tall and find the water is a little deep for you to enjoy your hot tub as much as you wish. Even though you may be concerned that the seat is hard, rather than cushioned, rest assured because you’ll find it’s very comfortable. It’s made of super-sturdy plastic and is suitable for anyone up to 292 lbs. 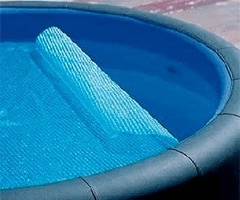 Because the material the seat is made of is solid and not hollow, the seat sits firmly on the bottom of your hot tub with moving. This is a big advantage over other hot tub seats which require filling with water or marbles to weigh them down and keep them on the bottom of the spa. The seat is 18½ inches wide x 14 inches deep x 8½ inches tall. What’s really useful is that the seat has adjustable legs, so you have two different heights to choose from: 2 inches or 4 inches. Top Tip: The seat will not rust in water or damage the floor of your inflatable hot tub, so you can leave it in the water when you are not using your hot tub. Remember that when you clean your inflatable hot tub, you need to clean the seat as well. In no way are my wife or I science-minded. So it came as a huge relief to find these great little test strips online when we first bought our inflatable hot tub. As part of keeping your hot tub water clean and safe to use, you need to test the water regularly. This involves making sure the pH is at the correct level, that the Total Alkalinity of the water is correct, as well as checking that the chlorine or bromine levels are safe. Now all of that would have caused us quite a few headaches if it wasn’t for the Poolmaster 4-Way Test Strips. To test any of those levels, you simply take one strip, dip it into your hot tub water for a few seconds, then hold it against the easy-to-read color-coded panel on the back of the container the strips come in. It’s that simple and a real relief. So whether you’re a newbie, someone like us who is worried about this area of owning your inflatable hot tub, or even someone with a working knowledge of chemistry, you’ll find these test strips are well worth buying. Top Tip: We have several guides written for anyone who is worried about the chemistry of owning an inflatable hot tub. The two which we believe are the best place to start are: Your Guide To Inflatable Hot Tub Chemicals which is written especially for the beginner and non-scientist in mind, and there’s also How To Test The Water In Your Inflatable Hot Tub (both articles open in new tabs). Keeping the water in your inflatable hot tub as hot as possible is vital if you want to save time, energy and money. One way to do this is to purchase a floating thermal blanket for your hot tub. This sits on top of the water and maintains your water’s heat at your preferred temperature. Always keep in mind that heat rises. That means that most of your heat loss is from evaporation off the surface of your hot tub water. Even though your inflatable hot tub will come with a cover, any gap between the underside of the cover and the surface of the water is space where evaporation can take place. This means the water will lose heat. Then, when you want to use your inflatable spa again, you’ll need to give the heater a boost. This takes time and costs money. That’s why a floating thermal blanket is a good investment. The initial outlay, of around $50, will end up paying for itself over the years. 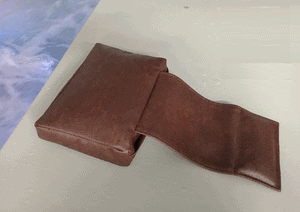 Having a floating thermal blanket will also cut evaporation to almost zero. As well as cutting heat loss, this means there will be less steam hitting the underside of your cover, depositing chemical residue on the underside of the cover. This means you won’t have to clean your hot tub cover as frequently as if you didn’t have a blanket on the water. Top Tip: There are several options you can buy on sites like Amazon. Make sure you buy a thermal cover that you can cut to size, so that it will perfectly fit your hot tub. 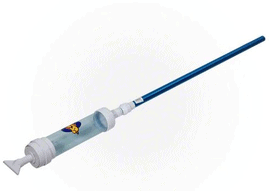 To keep your water as clean as possible, you need to clean the filter cartridges regularly. You can rinse them through under a faucet or with a garden hose. But to give them a deep clean, to make sure you flush out all the debris and hair, you need to open the filter fins. The easiest – and best – way to do this is with a special tool which fits on the end of your garden hose. There are several different ones you can choose from, but we recommend the Mi-Way Aquacomb. It’s designed to prise open the pleats and drive the water deep into the filter, to flush out dirt, grime, hair, bugs, etc. It also has a switch so you can adjust the pressure, from 35-55 lbs inch². Top Tip: Most inflatable hot tub manufacturers recommend you should rinse the filter cartridge in clean water after each time you use your hot tub, and then give it a deep cleaning once a week. However, because it only takes about 3 minutes to give the filter a deep clean with a spray cleaner tool, it’s easier to use the spray cleaner tool each time. You’ll end up spending less time keeping the filter clean and it will extend the life of your filter cartridge as well. 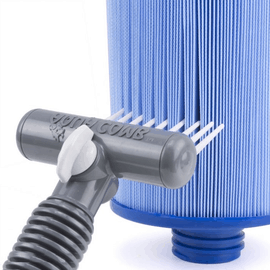 You might also want to check out our article on How To Clean Your Inflatable Hot Tub Filters (opens in a new tab). We like to have good neck and head support in our inflatable hot tub, and so we have tried several different spa pillows. The first ones we tried were cheap blow-up cushions, but these wouldn’t stay in place, so we moved on to a set which had suction cups to keep them place. But these kept slipping after a few minutes. Then we lucked out and found the weighted Hot Tub Headerz over on Amazon. 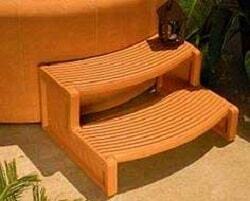 These are adjustable headrests designed especially for hot tubs. The great thing about them is they will fit any inflatable hot tub and the weight-system means they will stay in place. How they work is that you have the pillow part, which you lean your head on. Attached to the pillow, coming off the back, is a thick strap with a heavy weight in the end. This strap is flexible and hangs over your hot tub wall. The weighted end then keeps it in place, snug against the wall, by acting as a counter-weight. Brilliant! The pillows and strap are made of luxury marine grade vinyl, and with the right care will last for years. The pillow is 12 inches wide x 8 inches wide x 2 inches thick; while the weighted strap is 14 inches long x 7½ inches wide. Top Tip: You need to take the pillows off your hot tub when you put the cover on, once you finish using your hot tub for the day. When you do this, use a Scumbug to wipe down the surface of the pillow to remove any oils and sweat. In this way, you’ll be keeping the pillows in perfect condition. We hope you enjoyed reading this article, and maybe it’s inspired you to check out some accessories for your own inflatable spa. We cannot stress enough, though, that you really do not have to purchase any accessories in order to enjoy your inflatable hot tub. They’re great as they are, and any accessory is just the icing on the cake. Thanks for reading!